Life After LSE: How could Brexit help engagement with emerging economies? After graduating from the MSc Development Studies programme in December International Development alumna Bharthi Keshwara has gone on to a role as Economist at the Centre for Policy Studies. In this article she provides us with an overview of the work she’s been doing on Brexit and Britain’s relationship with emerging economies. 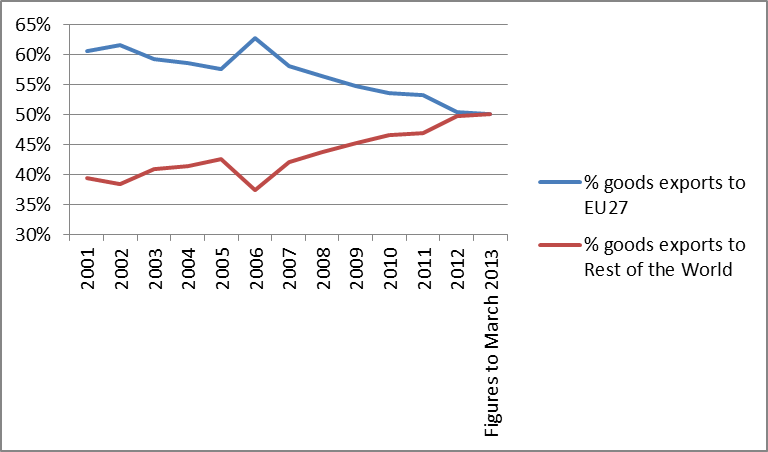 The share of UK exports destined for the EU fell 10 percentage points between 1999 – 2014. Declining terms of trade with the EU has continued to deteriorate the UK’s overall trade balance, leaving Britain with the 2nd largest trade deficit in the world reaching £61.6 billion in 2014 compared with £11.2 billion in 1999. The deficit signifies importance of trade with non-EU members, particularly China and India – fast growing consumer markets. The EU and India have been negotiating a trade and investment agreement since 2007. Currently the agreement has stalled as India is reluctant to accept regulations on its labour market and EU protectionism in agriculture. Similar negotiations with China to upgrade the EU-China Trade Cooperation Agreement to an EU Association Agreement have failed to materialise. This justifies Employment Secretary, Priti Patel’s belief that Britain’s EU membership has “acted as a barrier” to fostering trade and investment arrangements with emerging markets. Freeing Britain from the EU, inducing realignment of Britain’s foreign policy could unleash more comprehensive trade agreements with emerging markets. Many emerging markets are adopting a new growth path: from export-led to consumption based, creating opportunity for exporters of final goods. China’s consumer spending as a proportion of GDP grew 71.4% between 2010 – 2014 and India’s consumer spending is expected to more than double to $2.4 trillion by 2018. 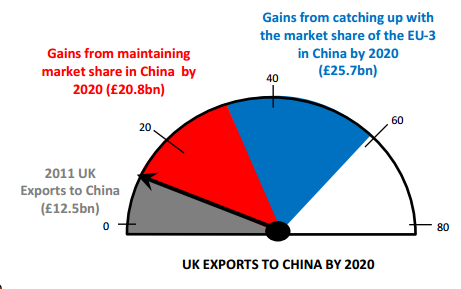 However UK exports have failed to keep up with increasing demand in the Chinese market. The export mix (predominantly services) is not well-aligned with China’s growing consumer sectors: machinery and electrical goods. By exiting the EU, and its regulations, Britain could more easily accommodate for consumer preferences in emerging markets. Since January 2015, Chinese economic growth has slowed. Its exports and imports have dropped sharply – 11.2% and 18.8% respectively. China’s, lack of political diversity and autocratic controls prohibit innovating quick solutions to unfamiliar challenges. Both China and Britain believe they are at the “golden era” of their bilateral partnership. However, considering China’s current turbulent transition, Britain should not rely solely on China in the short to medium term to improve its current account. In the event of Brexit, Britain should consider strengthening its ties with other emerging economies not only in Asia, but also in Africa and South America. Despite the looming EU Referendum, Indian investment into Britain has increased, ranking India as Britain’s third largest source of FDI. This highlights existing intimacy between both nations. India sees a successful innings of trade and FDI in Britain as a “gateway to Europe”. Hence Britain’s long relationship with India shall withstand Brexit. China views trade relations with the UK in light of Britain’s EU membership and is consequently against Brexit. Likewise an Indian industry group expressed Brexit would create “considerable uncertainty” for Indian businesses in the UK. However, Britain receives the highest level of FDI than any other EU member state. Considering Britain’s attractiveness, lying in its robust financial services and Britain’s “soft powers”- potential impacts of Brexit should be short-lived. Wang Hongzhang, chairman of China Construction Bank made it clear that “whether the UK will stay in the EU or not will not harm trade and economic ties between the UK and China”. Recently, the People’s Bank of China announced London to be the global centre for Renminbi trading. Chinese ministers are also determined to implement Chinese-designed nuclear reactors in Britain. These ventures do not reference Britain’s “influential” EU membership. If emerging markets want to conduct business directly with Britain, they will. Following Brexit, Britain and the EU may form a European Economic Agreement including free trade but reduced policy dependency and Turkey may insist on similar partnership with Britain. Brexit would position Britain’s association with the EU from an outer-tier, which Turkey would most likely replicate. A Brit-Turk outer-tier alliance would foster improved cooperation in the future. Turkey’s contentious border and its majority Muslim democracy are strategically attractive. Britain’s friendship with Turkey would anchor such a nation in cooperation with the West. Britain’s separation from the EU would encourage Britain’s friendship with Ankara who is armed with the nexus of future Western and central Asian geopolitics. Ensuing Brexit, Britain will still be a prominent member of the Council of Europe, UN, G8, NATO, IMF, and Commonwealth. Further, Britain will regain its seat on the World Trade Organisation – a platform for forming new trading relationships, especially with commonwealth nations replacing those with the EU. The world’s economic centre of gravity projected to be between India and China by 2050, is signified by construction of Asian financial institutions. Intuitively Britain has become a founding member of the Chinese led Asian Infrastructure Investment Bank. Brexit would enhance (re-)negotiation of more effective politico-economic relations – increasingly important as geostrategic competition intensifies. Whilst in conversation with Sachin Pilot, former Indian Minister of Corporate Affairs, at the LSE SU India Forum he remarked “I don’t think Britain leaving the EU will have any impact on India’s relationship with Britain.” Hence, Britain’s EU membership is irrelevant to relationships with emerging economies. The EU’s deteriorating trade with Britain and ineffective trade negotiations prompts questions as to why the EU has not organised a comprehensive plan. Such uncertainty and helplessness of the EU may cause it to break down, completely – it is better to leave now, whilst you still can and embrace the superpowers of tomorrow. This article was originally written for the Centre for Policy Studies. To find out more about joining the LSE Alumni network, and how you can get involved in activities within the International Development department and the wider school please visit the Alumni Hub. Alternatively if you’d like to write a post about your own experiences of “Life after LSE” please feel free to get in touch with one of the blog team. There are more global threats such as international terrorism, climate change and antimicrobial resistance. The UK needs to consider how it will lead the world in tackling these issues.